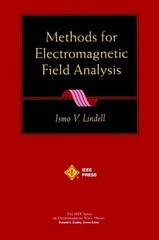 This monograph discusses mathematical and conceptual methods applicable in the analysis of electromagnetic fields and waves. Dyadic algebra is reviewed and armed with new identities it is applied throughout the book. The power of dyadic operations is seen when working with boundary, sheet and interface conditions, medium equations, field transformations, Greens functions, plane wave problems, vector circuit theory, multipole and image sources. Dyadic algebra offers convenience in handling problems involving chiral and bianisotropic media, of recent interest because of their wide range of potential applications. The final chapter gives, for the first time in book form, a unified presentation of EIT, the exact image theory, introduced by this author and colleagues. EIT is a general method for solving problems involving layered media by replacing them through image sources located in complex space. The main emphasis of the monograph is not on specific results but methods of analysis. The contents should be of interest to scientists doing research work in various fields of electromagnetics, as well as to graduate students. The addition of problems and answers in this reprint will enhance the teaching value of this work.